Whenever you go to a new place, you always buy souvenirs. Souvenirs are proof that you went to a different place, and more importantly, it serves as your reminder so when you see it, you will remember the place and your experiences there. Bak Kwa – Bak Kwa is a favourite snack of locals especially Chinese. You can purchase preserved Bak Kwa and relive Singapore when you get home. Sling – If you want to bring a taste of Singapore home, you should buy a Singapore Sling. Many people consider Sling as the national drink. Word of caution though, you may get intoxicated as this drink contains gin. Plated Orchid – In this souvenir, a real orchid is coated in 24k gold which makes it expensive. Many people never consider this because it is expensive but if you want one, you should have one. Frozen Laksa – If you like to bring Laksa (curry or sour fish) soups, you can purchase frozen pastes and cook it back home. There are many laksa out there offered in supermarkets and other souvenir shops. Kaya – Kaya is a spread made from coconut milk, sugar and eggs. It is uniquely Singapore. It is perfect with bread. If you don’t want to buy expensive items (like plated orchid) or something that can be spoiled or consumed (frozen laksa, jam, kaya, etc. 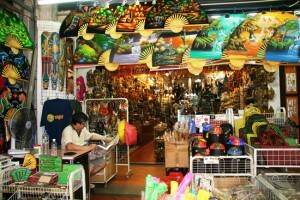 ), consider other simple souvenirs like shirts and keychain. You can find these souvenirs anywhere so don’t worry.